There’s something about Christmas time that makes me want to create. We needed a wreath and I had really been itching to use some of the burlap we had left from our wedding. I’m pretty pleased with the results! It’s so easy to switch it up too. I’m not sure which I’ll end up with on our front door. My husbands vote was either for the floral one or for the striped one with the bow added on. Step Two // Cut your pipe insulation to the desired length and tape the ends together. It might bend awkwardly but once it’s taped you should be able to make it stay in a circle. Mine is about 20″ across. Step Three // Cut strips of burlap. Doesn’t need to be perfect, my strips were about 3″ wide and I just cut, I didn’t make sure they were straight. Step Four // Start wrapping strips. I didn’t glue or pin the end (you can! ), I just went around the end once to keep it in place. Cut more strips as needed. Step Five // When you’ve covered the whole thing pin or glue the end piece to the wreath. 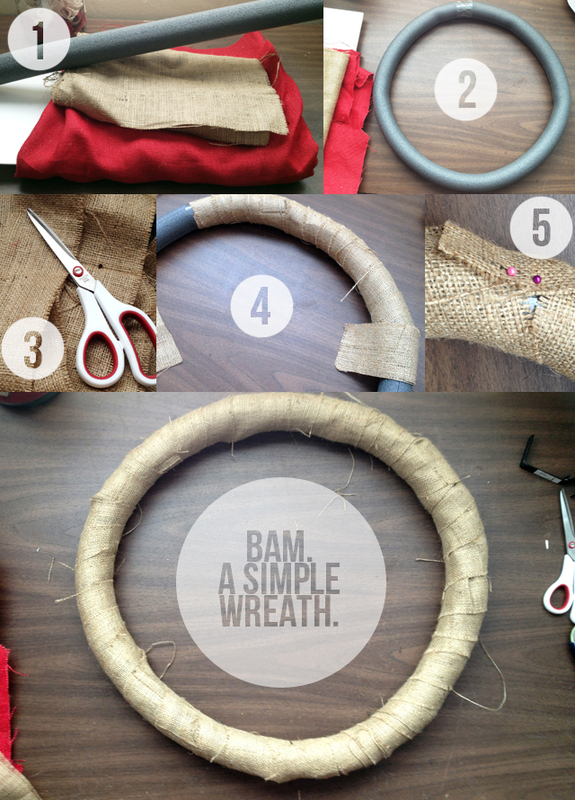 Congratulations, the world’s easiest burlap wreath. Now let’s make it pretty. Step One // Cut out squares of red burlap in various sizes. Mine were random between 5″x5″ and 3″x3″. 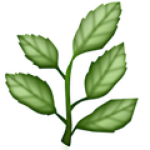 Feel free to use bigger squares for a bigger area of flowers! 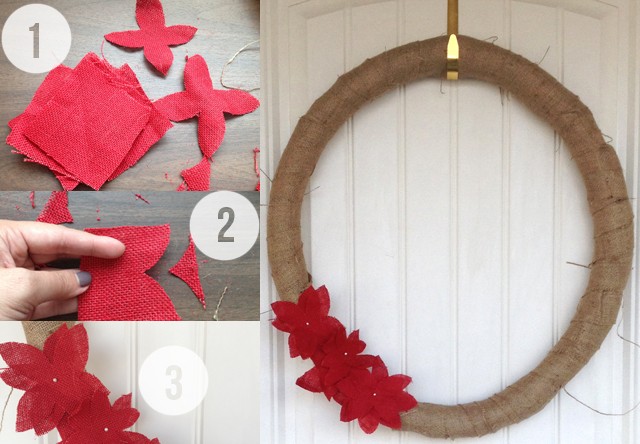 Felt would also be good if you can’t find red burlap, it’ll keep it’s shape better and give a different texture to the wreath. Step Two // Cut the flowers out. Tip: don’t try to cut all the way around. I just start at the corners and cut out a curved V shape. So much easier! Step Three // Arrange and pin/glue flowers to wreath. Done! 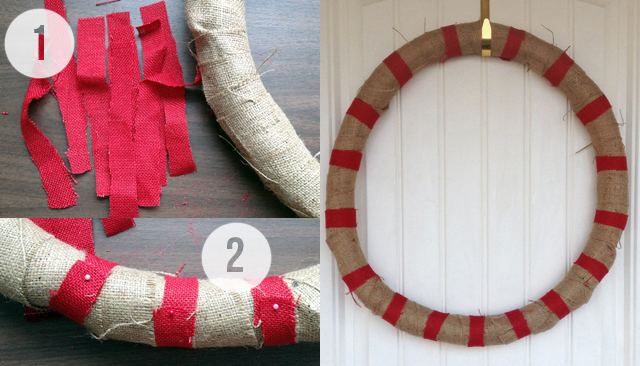 Step One // Measure around your wreath to figure out how long you need your strips to be.Cut several strips. Mine are about 1″ wide, but I think thick stripes would look good too! Step Three // Wrap and glue/pin. Done! Step One // Cut out a large piece for the bow part and a smaller piece to wrap around so it’ll keep it’s shape. Mine was about 24″ x 7″. Step Three // Take the second piece of fabric and wrap it around (not too tight) and then glue or pin. 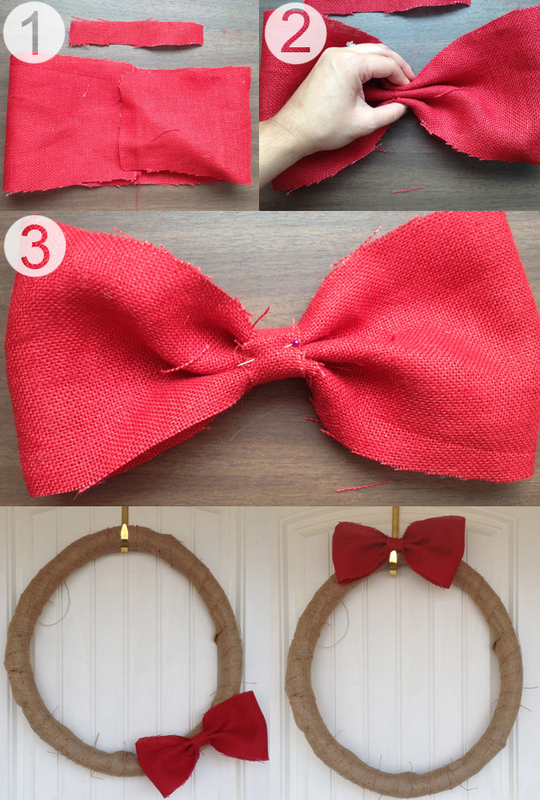 Step Four // Fluff out bow if needed and glue/pin to wreath. Done! 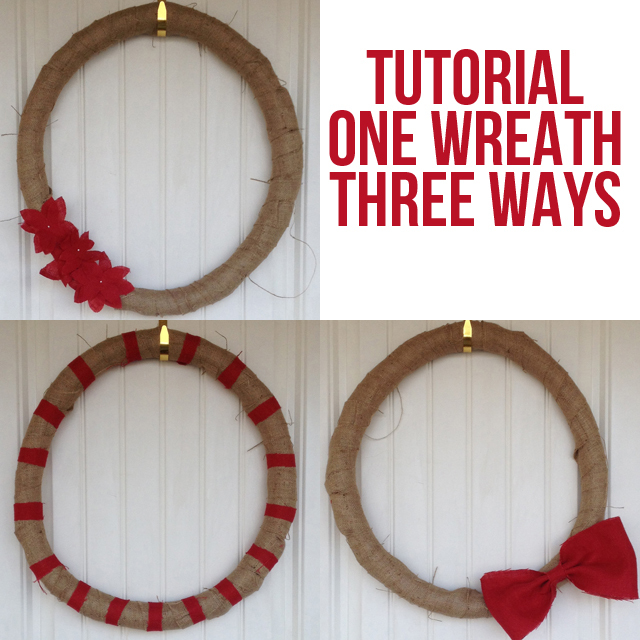 I’m totally loving this simple wreath. I tend to be drawn towards simple rather than overly showy so this wreath is perfect. 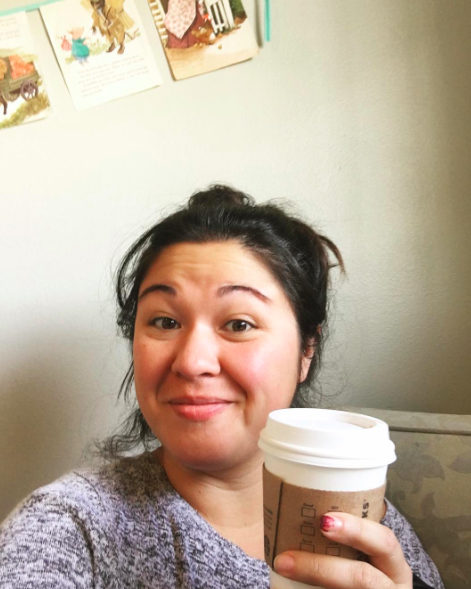 I’d love to see yours if you make one! Feel free to link it up in the comments.